Before ever setting foot in a yoga studio, I had a dance teacher in college who regularly called out “downward facing dog” during warm-ups. Despite the fact that very few, if any, dancers in the class were yoga practitioners, everyone knew what she was talking about. We’d dutifully press back from plank pose or hands and knees, reaching our heels to the floor and pushing our chests toward our thighs. I don’t recall my dance teacher ever actually teaching down dog. She didn’t have to. It was part of a dynamic, fluid warm-up. And thanks to the ubiquity of this asana in both yoga media and mainstream media, everybody knew what she meant when she asked us to go there. In the ten years since then, downward dog has only become more prevalent. But along with down dog’s prevalence comes several pervasive myths about what an ideal adho mukha svanasana should look like (remember my heels-to-floor/chest-toward-thighs reference above?). Unfortunately, many of these myths are rooted in unhealthy and exclusionary stereotypes about what a “yoga body” should look like and should be able to do, as opposed to what’s actually safe, functional, and accessible for our individual bodies. Since my dancing days, I’ve done a lot of down dogs in my own body, and I’ve watched my yoga students practice a lot of downward facing dogs as well. And what I’ve come to realize is that there is no one “ideal” way to practice the pose. Sure, there are some general cues and alignment instructions that I think can make down dog more safe, effective, and comfortable for most people most of the time. But many of these cues are focused on debunking commonly held misconceptions, rather than on making my body or anyone else’s fit an ideal mold. Other common cues, however—cues I used to give to others, and that I tried to apply to my own practice—are based on misconceptions and myths about the ideal down dog. These may lead us to seek impossible “perfection” in the pose, at the cost of our safety and enjoyment of the practice. The game-changer for me was the realization that the pose doesn’t exist for the sake of the pose—we don’t do down dog in order to master an ideal down dog. 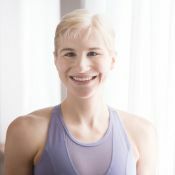 Rather, the pose is a tool we can use to feel better in our bodies, and that can serve us on the path to any of the states we might hope to reach through the practice of yoga—clarity, peace, self-acceptance, self-empowerment, spiritual connection, or simply the joy of moving, breathing, and being in the moment. Our reasons for practice are, after all, just as unique as our down dogs. By becoming aware of some common myths and misconceptions about this pose, we may start to discover the ways in which it actually serves us. We can perhaps let go of any false sense of failure that may come from not performing it in some mythical ideal form, and instead appreciate the distinctiveness in our individual expressions of down dog that are part of our own beautiful uniqueness. 1. You have to spread your fingers as wide as you can. “Spread your fingers like crazy!” was a cue that I heard, applied, and gave my own students for a pretty long time. But it turns out (as many of you may have learned firsthand—no pun intended) that spreading your fingers as wide as you can, all of the time, can create unwanted tension and discomfort. Now I advocate for a “light” or “gentle” and even spreading of the fingers in lieu of full-blown jazz hands. I’ve been experimenting with the position of my fingers when I’m not using down dog as a handstand prep. (When I am preparing to go upside down for a handstand, I find that spreading my fingers lightly and evenly apart and “clawing the floor”—resisting thumbs toward fingers and fingers toward thumbs—still feels the most stabilizing. But that’s not to say it always will.) I know that the only way to discover what works best for me is to try different things! Bottom line? When it comes to hand placement or anything else, yoga is about getting to know your body better, figuring out what works best for you, and adapting the pose accordingly—rather than doing something just because it’s the way you’ve always done it. Especially if the way you’ve always done it doesn’t feel good in your body. 2. Your heels are supposed to touch the floor. Not necessarily. Some people’s heels might touch the floor in down dog, and some people’s might not. And it may or may not have anything to do with flexibility. Yes, tight hamstrings and calves can make heel-to-floor contact more challenging (as a person with extremely tight calves, I know this well!). But if your heels don’t connect with the ground in down dog, it could also have to do with the length of your achilles tendon, and you don’t exactly want to stretch that. It’s a tendon, so its job is to stabilize, and it can be very difficult to heal an overstretched tendon. Hovering heels may also have something to do with bone structure. If someone has less range of motion in their ankles, they may not be able to touch their heels to the floor, no matter how much they stretch their calves and hamstrings. 3. Everyone’s ears should be in line with their biceps. When I first started practicing downward facing dog, I thought the point of the pose was to go deep—that getting my forehead to touch the floor was a sign of success. After I began attending class regularly and having my down dogs adjusted constantly, I eventually learned that no, this was not the case. Pushing my chest back toward my thighs and bringing my forehead down to the floor was actually causing me to lose my optimal arm rotation and “collapse” into my shoulder girdle, creating a lot of tension in my neck and shoulders. On the other hand, the cue “ears in line with biceps” really helped me find a more safe and sustainable down dog. But part of the reason why that cue worked for me was that my shoulders were “open” enough to get my forehead to the floor in the first place. Because my shoulders are quite “open,” it just so happens that when I bring my ears in line with my biceps, the back of my head is pretty much in a diagonal line with the back of my pelvis/tailbone—a good, neutral place to be in down dog. But for someone with less range of motion in their shoulders, “ears in line with biceps” might not make sense or lead them into their optimal alignment. Ultimately, the position of your head in relation to your pelvis is a better gauge of sound alignment than the position of your head in relation to your arms. 4. Your down dog should always be the same length. A great way to gauge a good typical length for your down dog is to start in plank pose, with your shoulders stacked over your wrists and your heels above the balls of your feet. From there, without moving your hands and feet, press back into down dog. And there you have it! Now, I love setting up my down dog this way if I’m going to be moving through vinyasa flows. It helps to ensure that I can move to and from plank pose without having to adjust my feet, making for a smoother, even, seamless transition with less fidgeting and second guessing. However, this isn’t my ideal down dog length, or my students’ ideal down dog length, all of the time. For example, if I’m preparing to kick up into a handstand, I’m going to take a shorter dog. Or if I’m working with a variation that challenges my balance—like a down dog twist or a scorpion down dog (catching opposite foot with opposite hand), a shorter stance is likely going to feel more stable. And finally, as many of us have discovered, super-slippery mats often call for slightly shorter dogs as well! If you feel yourself slipping and sliding on your mat, or you feel that it’s impossible to balance in a tricky down dog variation, you may need to scoot your feet forward a little. You are allowed to do that! 5. Your legs have to be straight. You know what? The “full form” of down dog—and of any pose—is the form that best serves you and your body at any given moment. A bent-knee down dog is as much a down dog as a straight-legged down dog. Either form can be a full form, depending on the practitioner and the circumstance. If, for example, your hamstrings are feeling tight, and/or straightening your legs causes your lower back to round, then lifting your heels and keeping your hips and heels lifted while you bend your knees may be a lot more optimal than practicing with straight legs. 6. You’re supposed to pull your shoulder blades away from your ears. When you lift your arms overhead, your shoulder blades need to lift too (it’s called the scapulohumeral rhythm, and it’s pretty important for optimal shoulder functioning). And though you might not realize it at first (since you’re upside down and all) your arms are in fact reaching up in downward dog. Therefore, pulling your shoulders/shoulder blades down isn’t going to be ideal. If you feel tension in your neck and shoulders, instead of pulling your shoulders down, there are other ways to create space in the pose. For example, I often find that tension in my neck and shoulders means that I’m pushing my chest back toward my thighs too much and going too “deep” (see misconception number 3). Bringing the back of my head back into a diagonal line with my tailbone often does the trick in relieving the tension. In place of a cue to bring your shoulders down, some people find very helpful a reminder to “broaden your upper shoulder blades,” or to “externally rotate your upper arms” (while keeping the forearms hugging in and the inner edges of the hands grounded), or to “lift the inner armpits up.” Unfortunately, none of these are quite as straightforward as “pull your shoulders away from your ears” (and, like any asana cue, may not be helpful or ideal for every person). But I’ve personally found that applying them helps me to release tension in the neck and shoulders while honoring the scapulohumeral rhythm. 7. A true down dog has to be done with your hands and feet on the floor. I LOVE taking a “wall dog” every now and then. It’s easier on my wrists than a traditional down dog—allowing me to spend more time refining my alignment, rather than having to come down for a wrist reprieve (and is ideal for situations where I’m not too keen on putting my hands on the floor). As I’ve said, I think the most important question to ask about down dog or any pose is “why are we doing this?” For me, my intentions for down dog (and thus my down dog’s form) may change, depending on where it appears in my sequence and what, if anything, a particular sequence is meant to prepare me for. Happily, I have the freedom to adapt the form of my down dog to serve my current needs. So do you. If we can let go of our search for the “perfect” expression of this pose, and start to see the ideal down dog as the form that serves us best in any given moment, then down dog can be a yogi’s best friend.